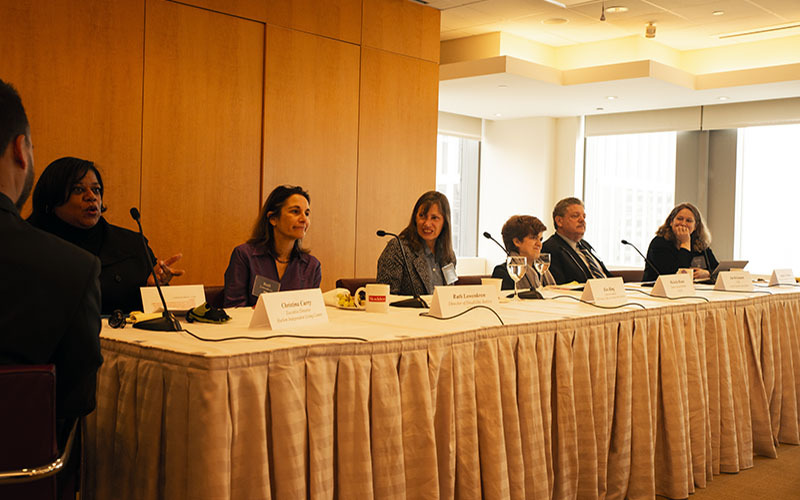 NYLPI’s Director of Disability Justice, Ruth Lowenkron, (second from left, above) and Senior Social Worker Michelle Kraus (third from right) were featured on a New York City Bar Association Pro Bono and Legal Services Committee Best Practices panel this morning about working with clients with disabilities, hosted at the Times Square office of Skadden, Arps, Slate, Meagher & Flom LLP. The panel also featured Christina Curry, Executive Director of the Harlem Independent Living Center (far left, above), Kleo King, General Counsel for the New York City Mayor’s Office for People with Disabilities (third from left, above), and Jim Weisman, CEO of the United Spinal Association (second from right). 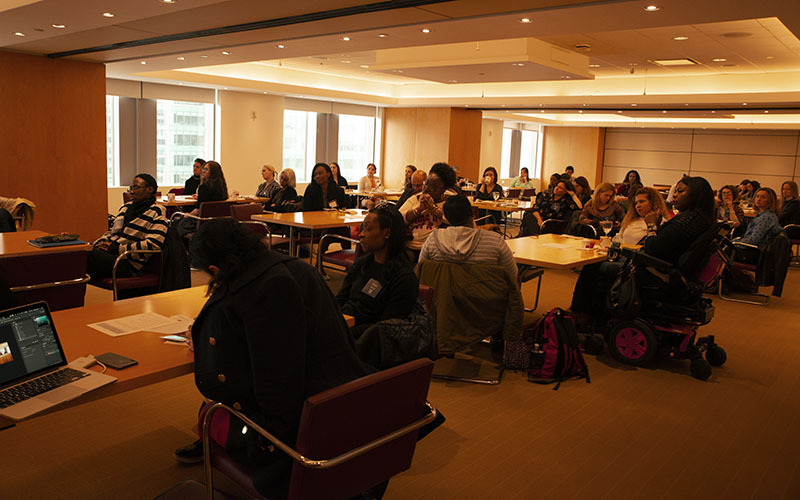 It was chaired by Jennifer Cowan, Pro Bono Counsel and Litigation Counsel at Debevoise & Plimpton, LLP (above, right). The panel began by defining what a person with disabilities is, and began by discussing invisible disabilities. Beyond the legal definition of having a substantial impairment, there are also other kinds of disabilities. The panel discussed litigation strategies protecting clients from inappropriate services from schools, in housing, and in transportation. Also, they touched on legal work in domestic matters such as divorces, and in employment discrimination. People in law firms don’t work with people with disabilities every day, Jennifer said. So: Are there pieces of information that they might find helpful to know? The theme of “common human decency” came up repeatedly. Ruth said lawyers should concentrate primarily on the story that the client is bringing to them, rather than thinking of them primarily as a person with a disability. If the client also happens to use a wheelchair, for example, then a lawyer should make arrangements that are accessible. Michelle said it’s important to consider communication preferences, preferred timing related to medications, or offering extra time for clients with intellectual disabilities. Special training isn’t required, said Jim, adding that the most popular publication from United Spinal is this one, called “disability etiquette”, because people are anxious about working with people with disabilities. But it’s important to handle situations with people with disabilities as you might with any other person, he said. And there is a lot to be said for training people so that they are able to exercise their decency. A full room of about 50 people paid attention to the panel. Christina said it’s imperative that law firms provide translators for people with communications challenges, and that people on the front desk of organizations often do benefit from training. Jennifer asked about whether the high cost of translators might be a barrier for pro bono work, but Christina pushed back. From the audience, Jackie Haberfeld, Kirkland & Ellis, LLP, pointed out that not all clients are literate, and that they do often hide the fact that they can’t read. She added that American Sign Language is different from sign language around the world. Christina said black and brown clients with disabilities are sometimes labeled as being hostile or aggressive in lawyers’ offices because of racist stereotypes, or because of stigma about their disabilities. At the same time, there was encouragement to law firms to take on cases related to disability justice. Erin Walczewski, pro bono counsel with Cooley, asked where to direct clients with small businesses who are looking to improve their accessibility. Jim said his organization helps with physical access, as well as with website communications because websites should be compliant with international accessibility standards around disability access. Kleo said there is a small business resources page at the New York City Mayor’s office, and said the New York State Department of Small Business Services knows all the permits that are required, and can help small businesses to negotiate that process. Christina recommended Independent Living Centers around the state.